Faith Bass Darling woke up one day believing that god had told her to sell everything she owns, and believing that she was going to be dead the next day. Faith is very ill, she has been struggling with memory loss and disorientation for some time now. Faith is fully aware that she is losing her mind, but has been trying to focus on living a normal life until that fateful day that she began moving all of her prized posessions onto the lawn. Posessions adding up to hundreds of thousands of dollars, which have been in her family for a long time. As strangers and not-so-strangers move in to take advantage of the woman, who is giving away the items for almost nothing, the townspeople and even some long lost members of her family appear to step in and stop (or help) Faith Bass Darling. Faith Bass Darling has a philosophy that will leave you thinking: she believes that self is everything you remember. If you no longer remember anything or anyone from your life, you are nothing. If Faith Bass Darling is about to become nothing, what does she care for material posessions, sentimental or otherwise? 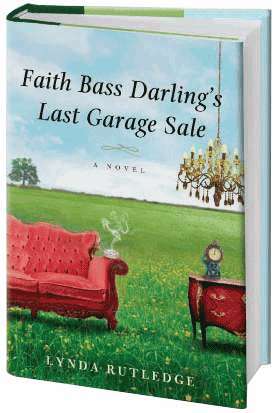 This novel qualifies as women’s fiction more than anything else, if you liked “The Secret Life of Bees” by Sue Monk Kidd, Faith Bass Darling’s Last Garage Sale, by Lynda Rutledge, is right up your alley.